FriLight Comet S 8710 plastic 12 volt marine surface mount light; 12-24 Volt LED G4 bulb or 12 volt Halogen/Xenon bulb with frosted lens. 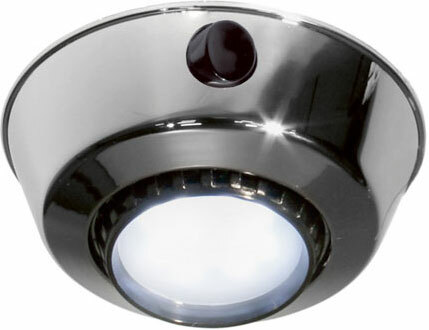 White or Chrome colored fixture color with LED bulb color options. Side mounted rocker switch comes standard on Comet 8710 boat lights. Choose from a Halogen/Xenon bulb (12 volt input only) or a LED bulb. Halogen/Xenon (halogen bulb with Xenon gas for added longevity) bulb: 10 watts, 12 volts. Energy efficient 12 SMD G4-pin socket LED Bulb. This LED is able to function on an input of 10-30 volts DC. Warm White, Cool White, Blue, Red, and 3-Way Dimmable LEDs available. Height 1.46" (37mm) or 2" at maximum tilt. Halogen: 12 volt dc input only! Fuse; transient suppression to protect against voltage spikes. Supplied with a Bee Green LED bulb which utilizes constant-current topology and is EMI free (no electromagnetic interference). Bee Green LEDs are produced with an 80 CRI value to provide excellent light color. Electrical protection: Contains a fuse and transient suppressor as protection from current overload and voltage spikes. These lights are great. I am using them to replace original equipment that have broken switches. They have the same look and footprint as the original. I ordered them with the optional Led bulbs and they have even better light than the halogens with a fraction of the energy consumption. Very nice. I would recommend these.